There are many friend groups in Tameside who look after an area or a piece of parkland and the friends of Gorse Hall are just one of them. They meet every Thursday morning at 9:30 am at a green portakabin within the grounds of Gorse Hall. It was a misty and drizzly Thursday when I went to volunteer and although I had been past Gorse Hall many times this was the first time I have been inside the grounds itself. The portakabin was very elusive at first and I wandered around a bit asking dog walkers and people returning from dropping off children at school if they had seen a green portakabin. They looked at me mostly puzzled like I was looking for a green crocodile. I felt like I was in a misty dream until one man pointed me back to the car park where I eventually found the mysterious green container. Oh dear. There was a sign for the volunteers saying this was the meeting point but no sign of the volunteers. I must have missed them. I thought it was a simple matter of wandering around the area until I saw someone working but it wasn’t as easy as I thought. I hiked up the main path through the 35 acre grounds. Eventually as I reached the ruins of Gorse Hall itself I saw a notice board which mentioned volunteers and had a phone number on it. I rang the number and a man named Alan answered and told me to continue on the path on right to the very top of Gorse Hall and I would see them. I eventually saw a group of men working in the grounds some mowing the grass; others litter picking and a man with a strimmer. I approached the man by the pickup truck and said, “Alan?” Luckily, he said “yes.” Alan told me that a hawthorn bush needed cutting back. He explained that it needed to be cut back for the winter and dense foliage is tempting for young people to congregate around and in the past fires have been started, it also wouldn’t be good for young children if their ball got caught in the bush and they weren’t able to retrieve it. I noticed that at the top Gorse Hall was the most magnificent view. Although the weather was quite bad and a large cloud sat on the hills you could tell that on a good day you see quite far. I was given a pair of secateurs I went to work on the hawthorn bush. It was quite hard work but I felt an amazing sense of being at one with nature in the fresh air. It started to drizzle I instantly regretted leaving my coat in my car because it was now 35 acres away. I chatted to Alan as we worked and he explained that he’d volunteered since the group formed in 1999 and got great pleasure in seeing the area transformed as a piece of ground that people could use rather than a wasteland. He enjoyed working with other volunteers, seeing them grow in confidence and having a sense of community. He also said that it discouraging when litter was left behind, dog mess, or there was vandalism or fires lit. Alan had volunteered for many years in different places and was now volunteering in Gambia to provide nurseries for those that lived there. I trimmed back as much as I could of the hawthorn bush and then Alan came forward with a chainsaw I must admit he managed to do a better job than me. While we were working away a lady walking her dog came over to thank us for the work that were doing on the grounds. Alan brushed away the compliments saying that it kept him out of trouble. I felt a bit of a fraud because I’d only been there for about half an hour. As we cut back the hawthorn bush it turned out that Alan was right because beneath the tree was a single beer can and some dog mess. I had no idea how either had got there. 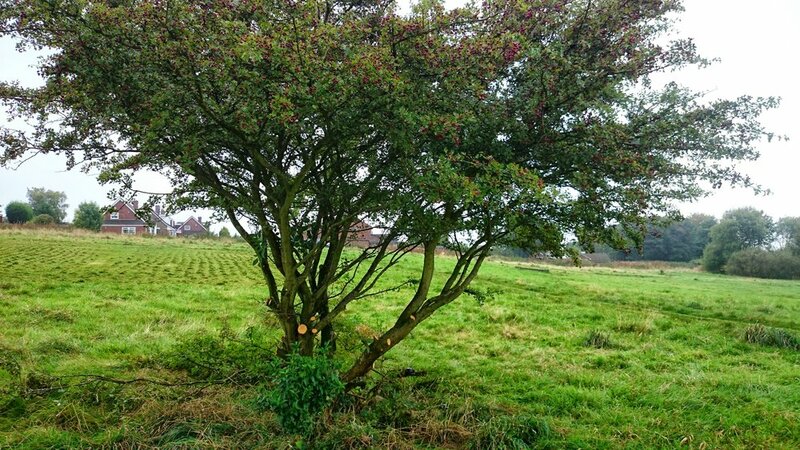 Alan moved the off cuts away while I was trimming the last bits of the hawthorn bush when disaster struck. The secateurs broke into two. Thank goodness Alan hadn’t let me lose on the chainsaw. Maybe this outdoor life isn’t for me. My immediate thought was to run off into the bushes but instead I sadly explained to Alan and he was very forgiving but I felt awful. The rain was coming down quite heavily now and Alan kindly gave me a cup of minestrone soup. I had never enjoyed soup more in all my life. We went down the hill with litter pickers and I collected bottles and cigarette ends and I found along the way I also got the opportunity to use the petrol leaf blower. It was quite a fun and I would describe as hoovering in the outdoors. Although after a while my arm ached. As I strolled down the path I realised that the beauty of the woods that I had enjoyed on the walk up was largely down to people like Alan and the other volunteers there. When you enjoy the countryside you don’t think about who picks up the litter; who made the path, or what happens to the dog mess. Alan mentioned that quite often the dog mess can be found in the fields so that when volunteers mow it to allow children to play ball it can get mixed in the lawnmower and you can imagine the mess. It was just such a wonderful experience to see people with a love for the local environment and working so hard and yet so unseen. We returned the tools back to the portakabin and I said my goodbyes. Just before I left Alan gave me a lettuce he’d grown at a school where he also volunteered. I felt a sense of achievement and a sudden sense of feeling healthier. I would wholeheartedly recommend working outdoors as a volunteer because it is not only good for your body and your soul to be with nature but you can make your local environment that little bit better. If you aren’t able to help directly then there is one message I would say. It is easy if your dog needs the toilet and you have nowhere to put it to leave it there but if it wasn’t for people like Alan and his fellow volunteers, Gorse Hall and many other places around the Tameside area would not be a pleasant place to take a stroll, for children to play or to walk your dogs and no one should be in fear whenever they mow the lawn.